Gaurishankar Chandrashekhar is an accomplished performer and dedicated teacher of the mridangam, the double-headed drum used in South Indian classical music. Positioned horizontally while playing in a concert setting, the right hand strikes the main side of the drum generating a metallic sound while the left hand strikes the bass side of the drum, setting the rhythm for the song or dance being accompanied. Gaurish learned under the guidance of Sri. K. Kalyana Krishan of Mumbai, who was a prime disciple of Tanjore Upendran. The basic transmission of this venerable South Indian drumming tradition is done via face-to-face lessons in which the guru (teacher) vocalizes first and then demonstrates the lesson. Given the intricacies and speed at which one has to perform, the brain has to be conditioned enough to be able to think and execute with sub-second lag, hence the emphasis on narrating (vocalizing) the lessons before learning to play and execute them at various speeds. Apprentice Kaasinath Balagurunath was seven when he was first captivated by the sound of the mridangam. He had first heard it at a house concert, and soon after that at a Carnatic Music festival held at the local Hindu Temple. Though his parents thought he might be too young, they supported his desire to learn mridangam. After five years of study, Kaasinath has become an aspiring mridangam player, performing at cultural festivals, and winning awards at competitions, including the Cleveland Thyagaraja Aaradhana. The goals of the apprenticeship are to ensure Kaasinath has learnt the appropriate approach to accompany and provide mridangam support for a two-hour concert. Special attention will be paid on improvisation techniques for solo performances. 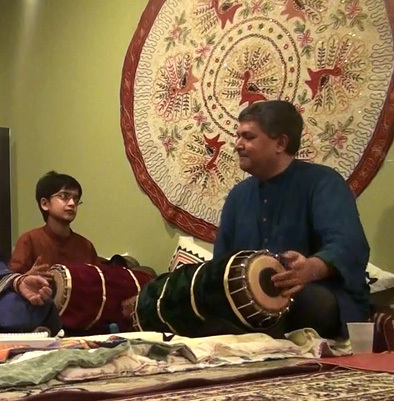 The apprenticeship will lead up to a public performance in which Kaasinath will give a solo performance demonstrating various playing techniques and strokes, accompany a Carnatic vocalist, and provide percussion for an Indian classical dance performance.